People understand who gives you your rights. Almighty God created us in ‘His Image’, we’re sovereign people. Our founders in their wisdom gave us a Constitution and BILL of RIGHTs to secure these rights by BINDING the power of government. 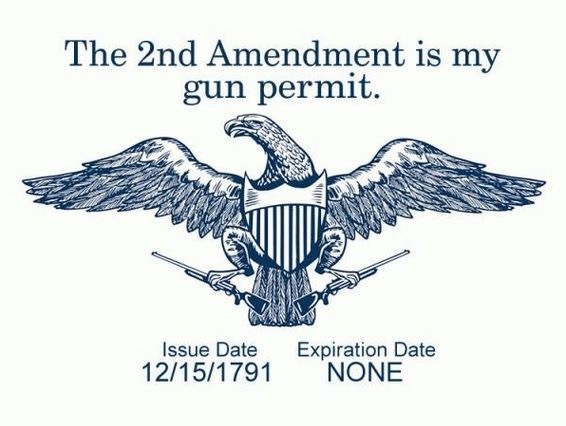 Licenses, Permits, Certificates, and anything ‘required’ by government to purchase is infringement Almighty God given rights of life, liberty, & prosperity. “If there isn’t a victim there isn’t a crime”. If there is a victim the criminal alone is to be punished, not law-abiding people by repugnant laws. GUN CONTROL LAWS ARE REPUGNANT! TRYING TO REGULATE EVIL AWAY IS IMPOSSIBLE, IT ENSLAVES GOOD PEOPLE THAT NEED NO LAWS TO DO WHAT IS RIGHT!